In the fast-paced world of metro DC, we offer our swimmers a chance to learn and improve at their own pace. Every swimmer learns in their own way and we embrace and nurture those differences. At SwimLabs Montgomery County, we recognize the importance of learning how to swim safe and correct, the first time. For those who are just learning how to swim, our unique facility offers a safe environment with experienced instructors who are at your side every step of the way. We offer a range of classes for every level of swimmer and all learning styles. Our Learn-to-Swim program includes private, semi-private or small group lessons in our warm water pools (no more watching your child shiver while instructors are working with kids across the pool.) We offer ParentTot classes for your little ones. We also have several certified Adult Learn-to-Swim instructors. No matter the ability level, learning style, or age, one key remains the same: our pools are the best place to learn and improve swimming skills. For the competitive swimmer, our facility provides immediate feedback through video and underwater mirrors—just like Olympians use. We offer an array of options for competitive youth and adult swimmers and triathletes, helping you perfect the mechanics of each stroke and compare your stroke to side-by-side videos of elite swimmers for a unique view of how to improve. Need to know if your lessons are cancelled due to weather? Click HERE to read on our weather closure policy. 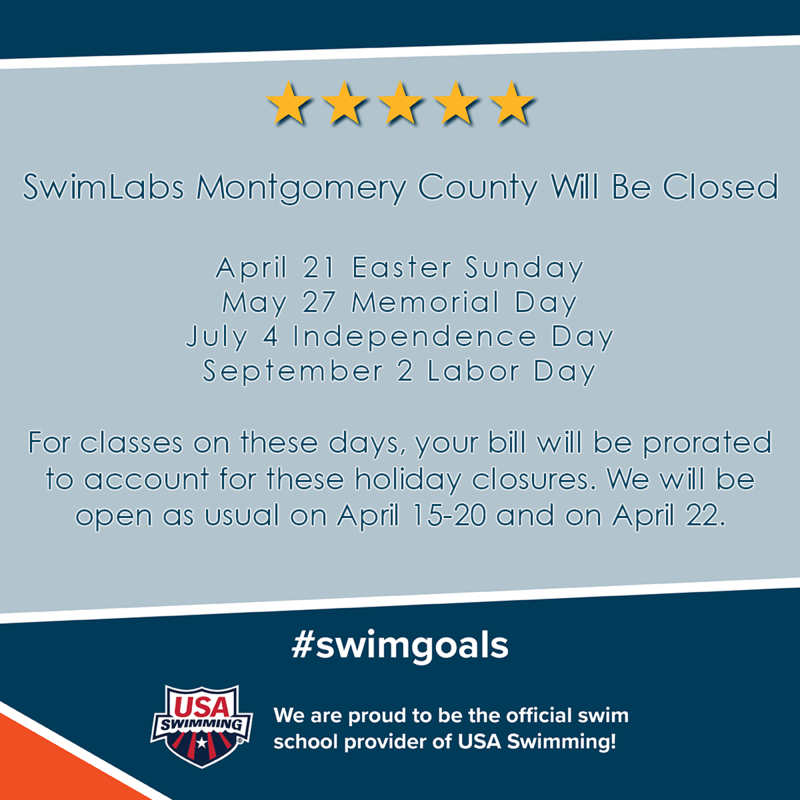 SwimLabs Montgomery County is excited to be part of the local swimming community and is here to serve Gaithersburg, Germantown, Rockville, Darnestown, North Potomac, Potomac, Muddy Branch, Crown/Rio, Kentlands, Bethesda, and more!